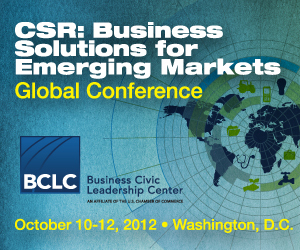 BCLC’s Global Conference is an established convening for the world’s foremost voices on global development, corporate social responsibility (CSR), and social enterprise. Attendees will represent executives and social practitioners from large and small companies, nonprofit organizations, and government agencies. RSVP: Credentialed members of the media are invited to attend some or all of the Global Conference at the U.S. Chamber of Commerce. RSVP by 10 a.m., Tuesday, October 9, to Bailey Gilchrist, External Relations Manager, 202-230-1877 or bgilchrist@uschamber.com. Unable to attend in person? Join the conversation via Twitter using hashtag #BCLCGlobal. BCLC is the U.S. Chamber’s resource and voice for businesses’ social and philanthropic interests. Its mission is to advance the positive role of business in society.